Unsatisfied with their previous IT team, our client seeks an experienced partnerto usher in a new era of success. 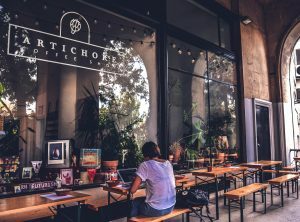 With a commitment to quality food, happy and fulfilled customers, and a mission to continually learn and grow, our client’s cafes have been serving people across the country with thousands of stores for over three decades. Always looking for ways to improve, they keep an open eye for ways to better help their customers. With an increasing need to predict the workload, supplies, and staff of day-to-day operations, our client originally worked with an outside firm in an attempt to build an accurate forecasting app. The initial project fell flat, and the the overseas based outside company failed servicing feature requests, working across timezones, and ultimately delivering. If our client could find an on shore partner to build a progressive SaaS application they could finally gain the insights they need to better plan their operations and ultimately save a lot of money. They needed a rebuilt app that optimized an intricate forecasting model and had a practical plan for implementation. 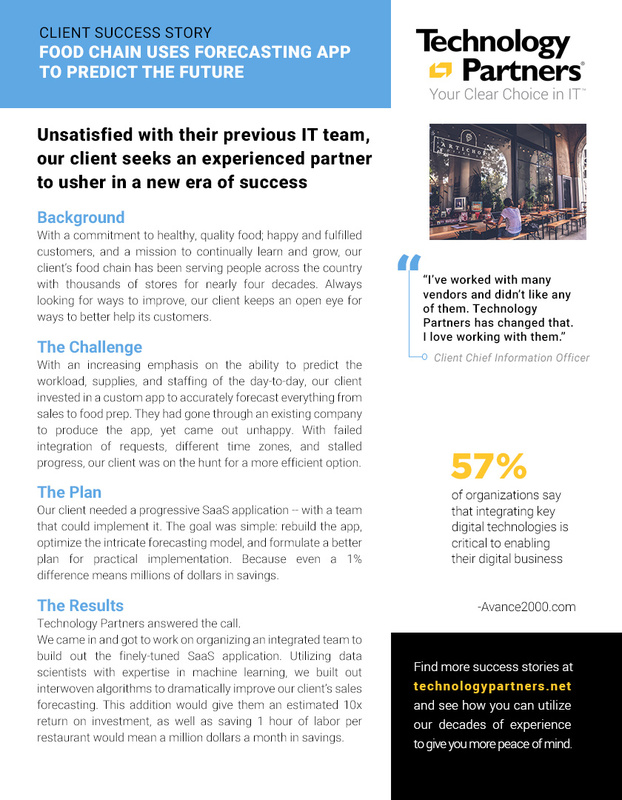 The onsite team at Technology Partners was the clear choice. Our solutions team leveraged their existing collaborative experience and got to work strategizing the solution. Utilizing data scientists with expertise in machine learning, we built out interwoven algorithms that dramatically improve the operations forecasting. This addition gives them an estimated 10x return on their investment, as well as saving 1 hour of labor per restaurant per day. That hour equates to millions in savings and a happier workforce. Find out how our Custom Application practice can make a difference for you today.